Pharaoh's Secrets Video Slot Guide & Review - Casino Answers! Pharaoh’s Secrets is a 5-reel, 20-line video slot developed by Playtech, featuring a wild symbol, expanding wilds, scatter wins, multipliers, a free spins feature, a gamble feature and a bonus game. You can play the Pharaoh’s Secrets video slot at Bovada. Coin values on the Pharaoh’s Secrets slot machine are $0.01, $0.05, $0.10, $0.25, $0.50, $1 and $2. You can select from 1-20 paylines and 1-10 coins per line on a spin. You also have the option of activating the Xtra Win feature (which will be covered later in this review) when you play all 20 lines, which will increase your total bet by 50%. The minimum bet that you can make on the Pharaoh’s Secrets slot game is a penny per spin up to the maximum total bet of $600 per spin. Pharaoh’s Secrets has a huge betting range and is suitable for any online casino player – casual player, high roller or anywhere in the middle. You can manually skill stop the reels on Pharaoh’s Secrets at any time by pressing the “Stop” button in the middle of any spin you make. To play the Pharaoh’s Secrets online slot game, select your bet and press the “Spin” button. To play all 20 lines at 10 coins per line, you can also use the “Bet Max” button to spin the reels. The highest paying symbol on the Pharaoh’s Secrets slot game is the Chamber symbol. If you land 5 Chamber symbols on an active payline in Pharaoh’s Secrets, you will win its 5000 coin top jackpot. The Eye of Horus is another high paying symbol, which can pay up to 1000 coins for 5 symbols on a payline. The Pharaoh symbol is wild and substitutes for all symbols except for the Scattered Pyramid symbol. The Pharaoh symbol does not pay out by itself. It only appears on reels 2, 3 and 4. During the free spins feature, the wild symbol will become an expanding wild and will double your winnings. 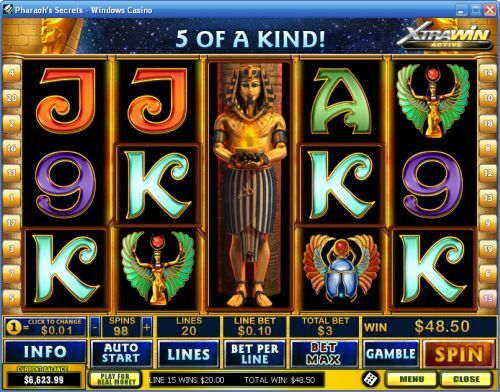 On the Pharaoh’s Secrets video slot, you can activate the Xtra Win feature, which will turn the Pharaoh wild symbol into an expanding wild symbol in the regular slot game. Activating this feature will increase your total bet by 50%. Scatter wins will be based on the new total bet, whereas payline wins will remain the same without the feature activated. The Pharaoh symbol will be an expanding wild during the free spins feature regardless of whether or not the feature is activated. You can use this feature to increase your winnings dramatically when you play at Bovada! Whenever you get a win on the Pharaoh’s Secrets slot game, you can choose to risk your winnings with the gamble feature. To activate it, press the “Gamble” button. You will be given the option of risking all of your winnings to double your winnings or only risk half to double half of your winnings. There will be 5 cards laid out. The dealer’s card is on the left. Your goal is to pick a higher card. If you are successful, you will double or double half of your win. If you lose, you will lose the amount of winnings you risked. You can exit the gamble feature and save your winnings by pressing the “Collect” button. You may play up to the double up limit, which is listed in the “Info” section. Only the highest win pays per selected payline. Winning combinations pay left to right only, except for the Scattered Pyramid (which pays any). Payline wins are multiplied by the bet per line. Scatter wins are multiplied by the total bet and added to payline wins. You can find the autoplay mode in the game buttons on Pharaoh’s Secrets. Under “Spins,” you can select up to 99 autoplay spins. To start the autoplay mode, press the “Auto Start” button. You can stop the autoplay mode at any time by using the “Stop” button that is located below the autoplay spin counter. Playtech is known for delivering amazing quality presentation in its video slots and Pharaoh’s Secrets is one of the reasons why. 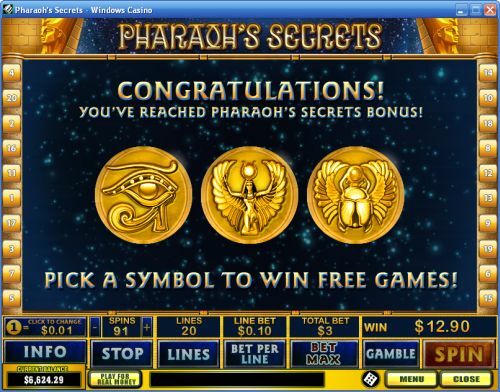 The Xtra Win expanding wild feature that is currently found only on the Pharaoh’s Secrets video slot gives Pharaoh’s Secrets something to offer that you can’t find elsewhere. To play the Pharaoh’s Secrets video slot, sign up and make a deposit today at Bovada! Are USA players able to play the Pharaoh’s Secrets online slot for real money? No, American players are currently unable to play the Pharaoh’s Secrets slot machine for real money. For a list of many other Egyptian video slots (some of which are USA-friendly), please read our list of Egyptian slots.